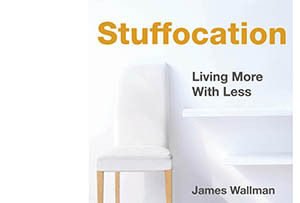 It's an illusion that owning more things will fulfil us, argues Stuffocation. But, to Andrew Wileman, the acquisitive urge is better understood as an endless search for perfection. This book says: stop collecting so much crap stuff and go on nice holidays instead. That gets my vote. I am engaged in a futile struggle to distract my wife from Homes and Gardens and to stop her replacing our faded but still very nice curtains. How can new curtains be so expensive? You would think the enterprising Chinese would have found a way to do them really cheap, but it seems not. I would much prefer to spend money hiking to Everest Base Camp. In fact, I just did spend money hiking to Everest Base Camp, in November. It was fantastic. Three weeks on ancient Sherpa paths up to Kala Pattar, watching the sunset turn Everest into a molten glow, cosy in a sleeping bag at 9pm and minus five in an unheated teahouse. As the Buddha says, the essence of life is suffering. And what causes suffering? Desire. To eliminate suffering you need to eliminate desire. So stop desiring all that useless crap stuff, it won't bring happiness. This book says you need to become an experientialist instead. Seek experiences not objects (although, apparently, you can buy a few really nice ones, like the very latest lovely Apple thing). The author missed a trick by not citing the huge growth of the self-storage containers market: Big Yellow Box, Shurgard, Safestore. What awful stuff have people got in there? These centres barely existed 15 years ago; now there are 1,000 in the UK. Why can't people just throw this stuff away, or put it on FreeCycle? If everyone in London did that we could reuse the storage containers as one-bedroom starter homes. I like the story in this book about the anti-stuff crusaders who measure their progress by how much they reduce the number of things in their lives. Researchers in Los Angeles found that even a small, average two-bedroom home contained 2,260 objects. The Counting Minimalists' challenge is to get that number below 100. Henri Juntilla from Finland claims to have got his down to 43. But as the book describes, there is controversy in Counting Minimalism land. Is a pair of socks one item or two? Or is your entire collection of socks one item, a collective of socks? It would not surprise the reader to learn that Counting Minimalists are usually male. I just took a coffee break from writing this review and my wife ambushed me in the kitchen with a photo of green cabbage-leaf plates on white shelves. She is collecting them as her new interiors style statement and she wants me to share her excitement. I am stunned and bemused. We have just junked 20 years of now-worthless Clarice Cliff Art Deco and now we are doing green plates? I tried to get her to read this book but she wouldn't bite. It is a strange one. The author (or maybe, to be fair, the publisher) isn't shy about its self-importance: 'My enquiries have taken me down two paths. One path has evolved into a manifesto for a new way of being. The other has led to a vision of the future.' Respect! But the decluttering, anti-materialism thesis is so well travelled you have to wonder why this was published. There's pretty much no data, just opinion and anecdote. The case studies - Sue and Bertrand from Clapham, Cliff in Silicon Valley, Medium Chill Dave etc – may well be real, but they could be made up; it wouldn't matter. It is a self-help type of book, but it isn't a business book, although 'decluttering' in the sense of decomplexifying has recently become a corporate theme du jour. I have just read a more interesting book, on understanding the female consumer, called Inside Her Pretty Little Head, written by Jane Cunningham and Philippa Roberts. Jane and Philippa run their own female-targeted market research agency called Pretty Little Head. One of their themes is women's search for 'perfection', for example, a perfect dinner party or holiday, but often it includes perfecting their physical environment, aka interior decoration, which means lots of lovely things perfectly chosen and displayed. They describe this search for perfection as innately and endlessly unsatisfiable. Unlike a man, who DIYs a room and thinks, that's that for 10 years, a woman immediately starts thinking about how to make a redecorated room even more perfect. It is a process not an outcome. It might look as if it's about buying and collecting stuff, but it is really about experience. So I'm afraid the author's 'vision of the future' – 'we have got enough, and we have had enough of stuff' – isn't about to come true. I will be fighting a losing battle against an onslaught of cabbage-leaf plates.